A trilogy of Murals today… Starting with my favourite artist, William Mitchell and his fantastic mural at the Three Tuns pub in Coventry. The mural is an incredible thing. 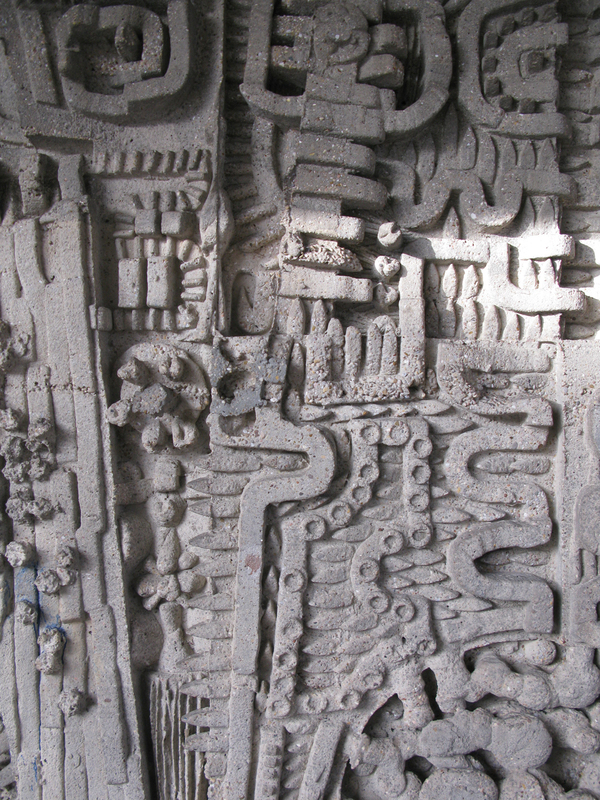 It dates from 1966, is about 11m long by 4 m high and is full of amazingly rich textures and a truly astonishing depth of surface. 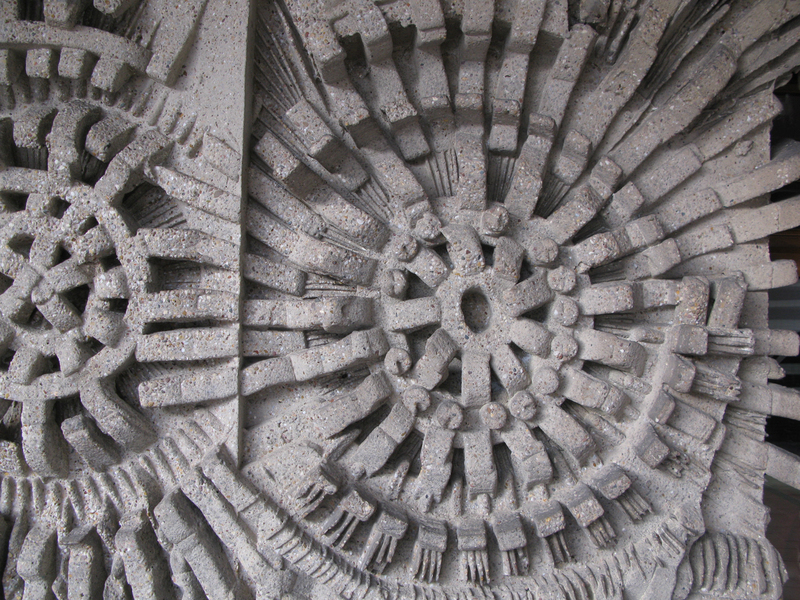 The whole thing was cast in concrete with a pebble aggregate and is two sided, offering a less modelled, but equally impressive view on the inside. I actually used to go to this pub in the early 1980’s (not very often as it was a townies pub and I hung around with students). It’s an Indian restaurant now and the inside wall has been painted white. 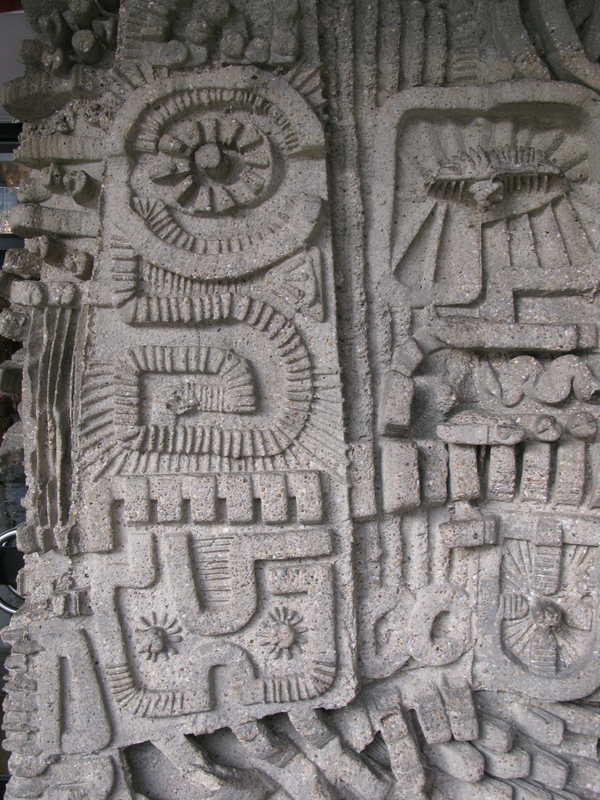 Until then, here are some close ups of what the Listed Buildings website calls his “distinctive Aztec style”. Still I have it on pretty good authority that the mural will be saved and incorporated into the new scheme, maybe on an inside wall somewhere so it can avoid the worst of the Midlands weather. Which brings me neatly onto the next mural that’s caught my eye recently, this marvellous wall of cermic colour by Gordon Cullen, which is also in Coventry. 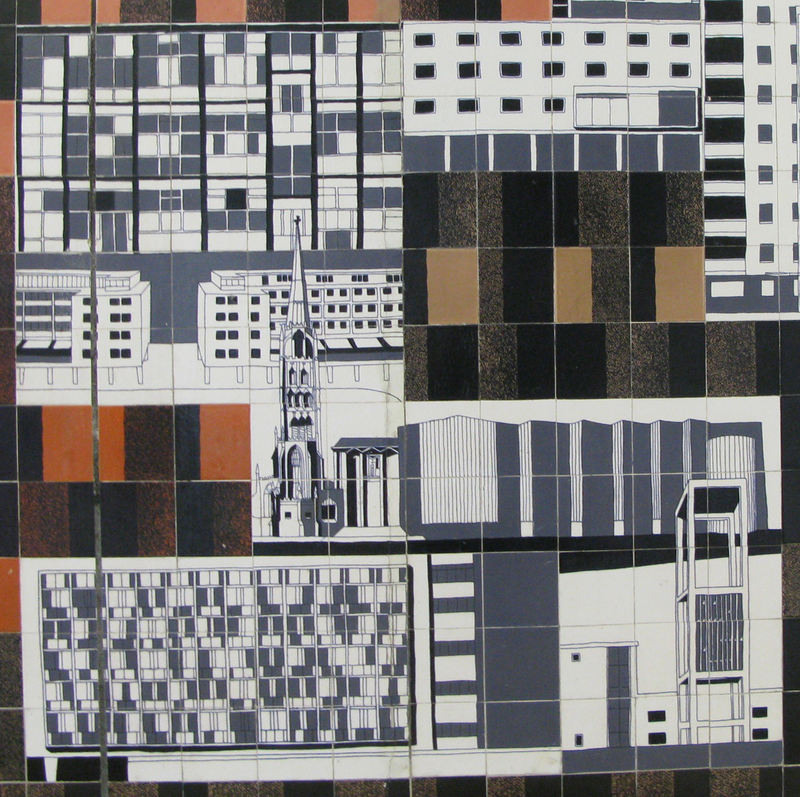 Cullen was an architect by training but was also a very gifted artist and is perhaps best remembered as one of the pioneers of Urban Design through his seminal 1961 book The Consise Townscape, in which he set out his thoughts on how the urban environment might be visually organised to achieve a better overall coherence. 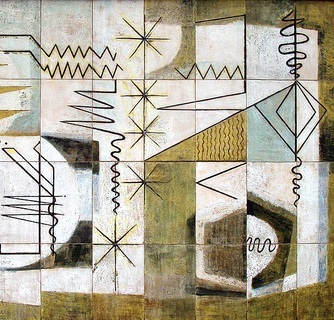 The mural was designed by Cullen in 1958 to illustrate the history and spirit of Coventry and its Citizens and was considered an important part of Donald Gibson’s recently completed City Centre rebuilding works. It was originally much larger than as shown above, but a sign nearby informed me that “careless workmanship in the 1970’s” (I can only imagine) lead to the destruction of panels that included medieval maps of the old city. Still the panels that remain give a good idea of Cullens style with their bold shapes and bright colours, referencing the new city centre buildings (including Spence’s Cathedral), bicycles (which the city was famous for manufacturing) and dinosaurs (although to be honest, I’m not quite sure where they fit in)… Bizarrely, this work is currently not listed, however it appears to be safe enough for the time being in its new home. 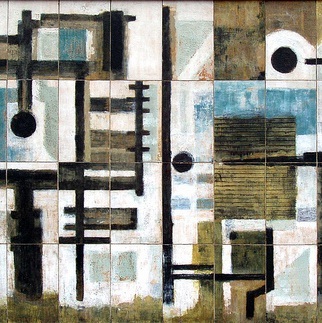 The mural is to be found on the old telephone exchange building on Farringdon Road in Central London and comprises nine stunning, hand painted ceramic panels designed in 1960 by the little known artist Dorothy Anann. 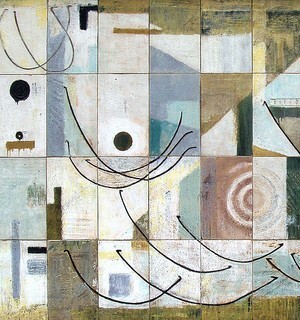 Although the work is untitled, and there is precious little about her on the net, I gather that Annan set out to depict various aspects of the communications and telephone industry, relating the work very much to the idea of Harold Wilson’s “white heat of technology” in a series of wonderfully stylised and abstract panels that although rather weather worn and grubby, are still in surprisingly good condition. The building was designed incidentally by Eric Bedford, the Chief Architect of the Post Office Tower, and like so many telephone exchanges across the country has been empty for many years and is facing almost certain demoltion, as unlike the mural, it was not thought worthy of Listing. Let’s hope the developers honour the Grade II listing status of Dorothy Annan’s fabulous work however, and find it a new home that is both appropriate and publicly accessible. Hi. 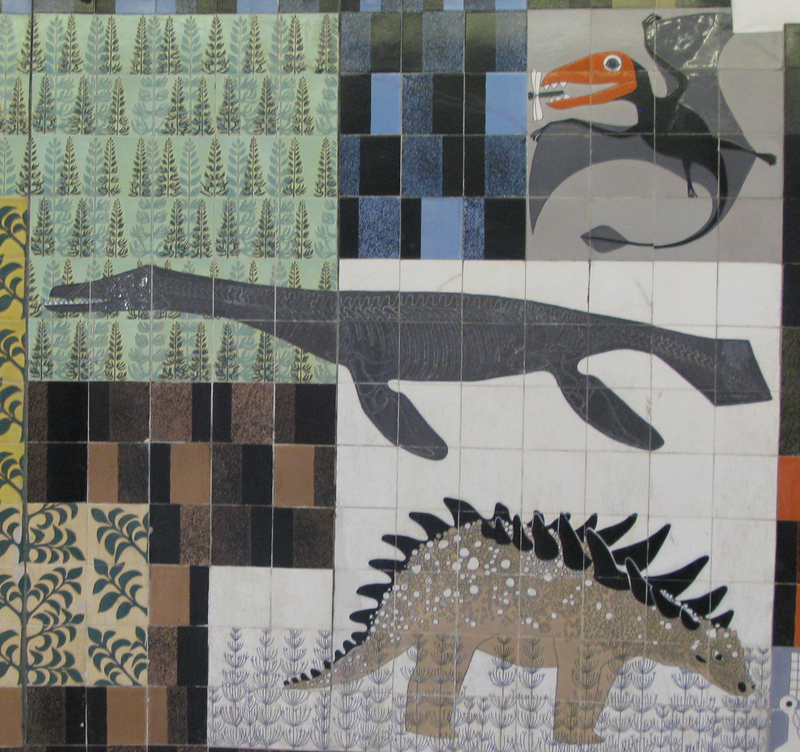 Could I use the pics of the Gordon Cullen mural in my website showing the work of Carters of Poole who made the tiles. I would be more than happy to credit them and provide a link. Having looked around your excellent site, I’m going to ask a return favour. Could I borrow some images of Tony Morris’s plates & chargers for a post I just HAVE to write on his stunning work, the most beautiful ceramics I’ve seen in ages. I will of course link the post to your site. When you have a moment could you email some images of the Cullen mural as I am losing image quality by downloading from your website. Let me know which TM images you would like and I will do the same. There are gaps on my webpage at the moment following changes with my hosting service. I am having to put it all back together one image at a time from the back up. I am about half way there. I will complete the Tony Morris pages when I finish Carter Tiles this week. Just read about William Mitchell’s Three Tuns pub mural in Waitrose Weekend 2nd March 2017 issue. 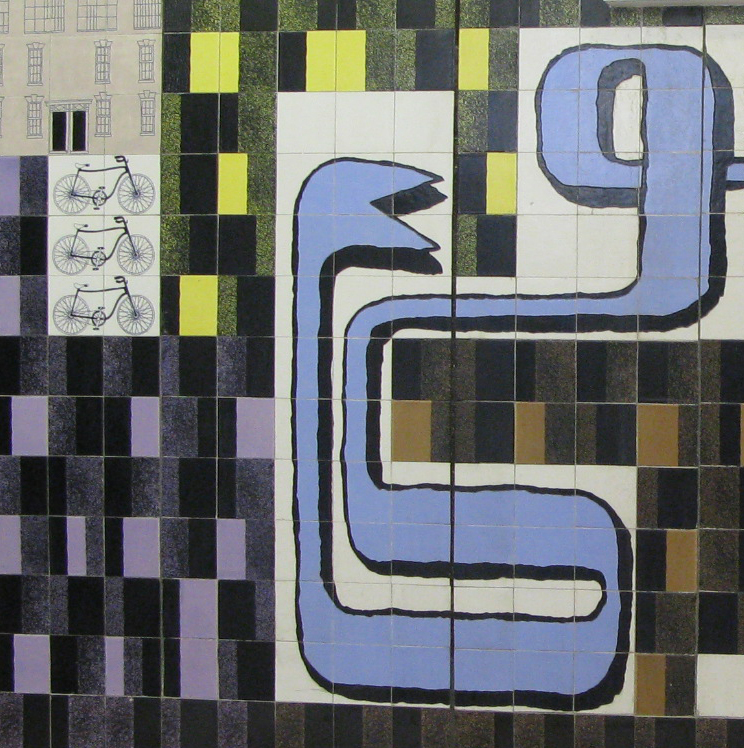 As a teenager in the 60’s I lived in Coventry and remember both this mural and Gordon Cullen’s city centre precinct ceramic mural.